Everyone going in, knew that there was going to be controversy and there certainly was. While I was safe and snug in the Press Box a little after 4 PM PST, thousands were outside waiting to get inside or protesting. They had set up designated "protest spots" for those who were protesting, to have a "safe space." 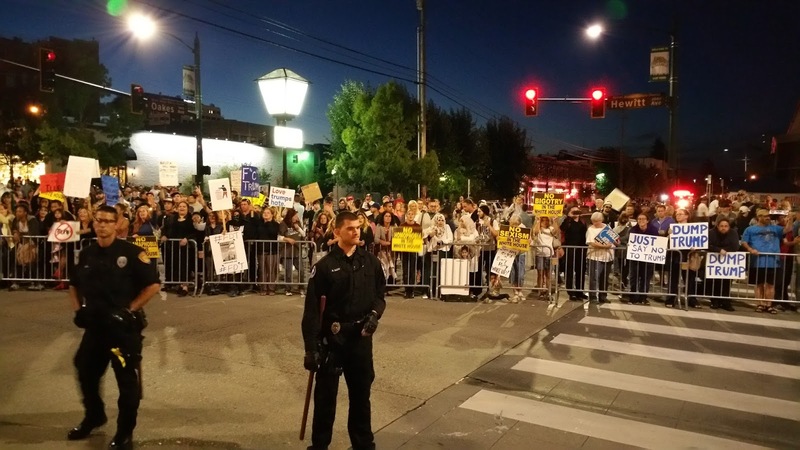 There was at least three, possibly four different instances where protestors from within the arena were physically removed or asked to leave. Most occurred during Trump's speech. 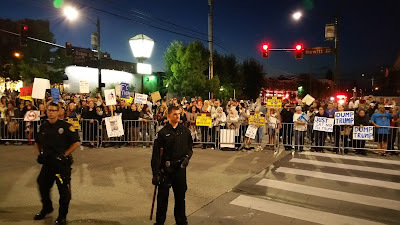 Authorities did well keeping order directly outside the arena's entrance. 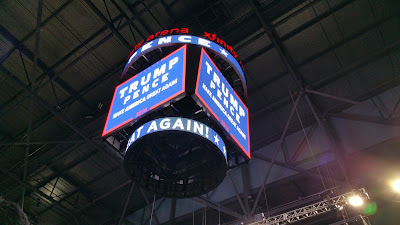 Credit is due to the campaign staff, arena staff and local authorities as things were relatively originated and kept the safety of the atmosphere up. There was also a very smooth and well appreciated transition into the building for Press, something Trump has criticized greatly. Not to worry Mr. Trump, Liberty Chronicle Independent has you covered from a non-corporate sponsored point of view. Watch the videos below for full coverage of Mr. Trump at the rally. Donald claimed during his speech that they had set a record attendance for the rally. There was definitely an electric atmosphere, similar to the Bernie rally that was held earlier this year at the Key Arena in WA. Notable guest speaker and former Mayor of New York, Rudy Giuliani spoke out against Clinton and gave his support towards Donald Trump. Giuliani recently spoke out about how he "saved more black lives than Beyonce," which helps further push the biggest subject Trump talked about at the event. Mr. Trump held nothing back towards his Democratic opponent, Hillary Clinton; referring to her email controversy and Benghazi. In what many may consider a surprise, Trump spoke mostly on minorities and addressing the issues within the inner-cities; both highly important national subjects to millennials. These are subjects that the Libertarian Party have fallen back on as a whole, but the Johnson campaign is picking up where fringe Libertarians are missing out. There were many minorities from many different ethnicities in attendance; something that the Libertarian Party has been criticized in the past (notably by former LP Presidential 2016 candidate John McAfee at the national convention that was held earlier this year in Orlando, Florida). Other notable subject Mr. Trump touched on were the NAFTA trade agreement and giving his word on changing it, along with being against the TPP. Overall, it was a good presentation to the state of Washington, which sides mostly towards the "left" in their voting record. There was no Press Conference held after the event, more than likely because Mr. Trump will be in Arizona tomorrow, to address border issues among other topics. Washington voters in attendance were certainly impacted by this memorable and eventful evening. Gary Johnson will be in Washington State in September, and certainly has an act to follow after this and the previous rallies held by Hillary Clinton in the local area. There is no denying it, this is certainly a major election year and turning point in America's history. 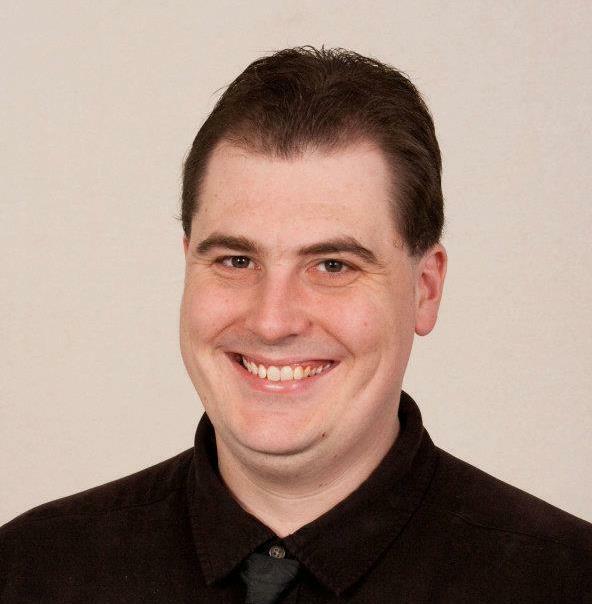 This contribution is from Seattle-based independent journalist, David Malekar, Independent Associate Editor for the Liberty Chronicle Independent; who publishes content to the WashCo Chronicle and other online publications. 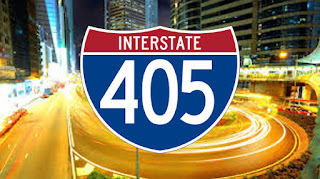 With the current 405 mess that has happened, there is absolutely no doubt that people should want something new. Reform is attractive and supporters of the republican party here in Washington are quick to speak up on the topic, of course because democrats seem pleased with the status quo per se. They just want to keep pouring your dollars for the next empty ideal. What if someone thought of an independent concept. Of course this idea I will present is not original, and is very well thought out by libertarians. Laissez faire, May be the method you can ponder. Too quickly, individuals may be reactive in their analyses of how this may work. This is of course why I am here to offer a quick taste. Avoiding the anarchist case of ethics, I will not pretend that this is what should be done everywhere. Small cities may have fine road structures they can maintain. But for cases like 405 in the Seattle area, any idea will not sound too radical at this point. I'm sure most people will assume that I am going to make a case for tolls. I will, but on the contrary, let's play with the thought that roads are like the radio dial. Tons of wide open space on 405 (we know this to well being scorched in the sun everyday). Advertising would flourish here. Imagine having tons of billboards lined up and down the road. Lots of people use the highway, would be a great place to get some attention (especially for mechanics!) The signs could have a “brought to you by….” logo on them, just under the directions that the sign intends to give. Tolling is actually not that heinous. We see the negatives of tolling because we are getting extorted elsewhere with taxes. This of course is not pleasant, especially when the road is public and managed bureaucratically. Tolling isn't so bad though if you are not being taxed, because like at a store, you don't get extorted before going! You make a direct purchase that you don't have to partake in if you don't want to. Now imagine. When a rush hour hits at a grocery store or let's say a Starbucks. The management prepares ahead of time to be as efficient as possible. What is very clear in my many hours of traffic is that government does not handle things this way. Think of a road business that actually prepares for rush hour, and handle it the most efficiently. 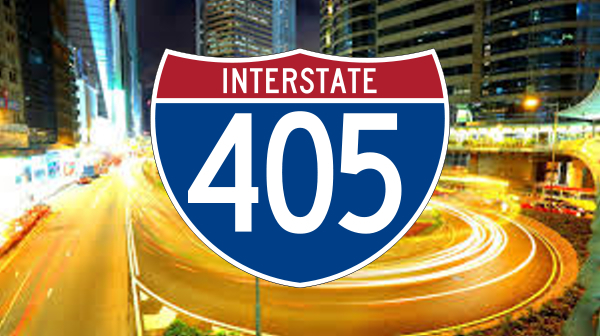 They may offer tolling rates for different speeds, on specific lanes or even separate roads. If you want to really get by fast, you can $4, while a slower lane goes for $0.75. Then you could have the open public road, that is theoretically free (in the case I am presenting). This may sound somewhat familiar, yet the differences are that rather than previous extortion as a method, it's a direct sale or possibly free for certain people. It also doesn't require stealing old lanes that were previously paid for by the taxpayers to then be transformed. All of this would be added on depending on the level of traffic. Through direct sales the company would generate profit differently and would have a better incentive to produce a product the area enjoys. Investors like local businesses and corporations would have incentives to make profit using this system through advertising, possibly making costs go down in the long run. Private roads would have less incentive to extort customers, so speeding tickets and seat belt laws could be a thing of the past. Lanes (as I pointed out above), could be divided; so no one is subject to a slow driver. This could be done in the general road or toll, it all depends on what makes profit for the company. That is a big issue with the modern toll system; the toll lanes (and carpool too) can get clogged, even more so than the general lanes sometimes! Counter productive, right? I am sure that a company seeking profit and opportunity wouldn't allow that. If it did, it would get the boot from the public. Accountability usually brings quality. With the profits the company could make, it could develop a rail system that follows the freeway and stops at all the exits; possibly giving way to new customers and getting car owners out of their car. What may appeal for the liberal is that clean energy initiatives could be supported through systems like this. The response for getting people out of their cars could call for a subsidy program, or what may be preferred from a more libertarian or laissez faire approach is a tax decrease. The company may want to implement roads or lanes specified for electric vehicles, or make rail systems that follow the freeway electric. Nobody wants to be extorted and then feel obligated through many of life's difficulties to pay for some outrageous toll, that had already been paid off by taxpayers. It's to say the least absurd. It is the epitome of cronyism and government corruption. All of this leads eventually to more people turning to more government monopolization, because the community didn't forth any new ideas. This contribution is from Washington-based independent journalist, Avery Hufford, Independent Contributor for the Liberty Chronicle Independent. I'll admit it freely. I am in a network marketing business. Now a lot of people immediately shy away from Network Marketing/Multi-Level Marketing businesses because some of the more shady ones have a very bad reputation. Personally, the business I am involved in offers legal and identity theft services to families and businesses. There are no potions, no lotions, no "pyramid scams". I get paid based upon the sales I produce, and the team under me produce. One of the most important aspects of running a successful network marketing business is exposing people to the information, and building a team of individuals willing to share the information with others and help grow the team. You don't even have to be a powerhouse recruiter - recruit 3 good people, they each recruit 3 good people, your team keeps growing and before you know it you've got at least 40 people in the team, if not more. Recruit enough good people, and the team grows with or without your involvement. The key to growing large teams is through warm market networking. Sit down with friends and family for five or ten minutes, and show them the information. No pressure - and some people just won't get it. That's ok - you have to go through the no's to get to the yes's. So why can't we follow a similar system for building the Libertarian Party? There doesn't need to be any monetary incentives to do this, we all want to see Liberty grow and prosper, and doing so is enough reward in itself. When you look at businesses like Uber or AirBNB, these are disruptive businesses which break the mold of traditional services, and through an almost viral word-of-mouth marketing, these businesses grow and prosper. Why can't the Libertarian party become a disruptive force as well? How do we grow network marketing businesses? Standardized tools, as well as events. When I was introduced to the Libertarian Party, there was a party website, and of course random sites with no real "this is an introduction to the libertarian party" standardized message. So it's time to fix this. Coming over the next few months, building up to the election in November, I will be developing a "toolkit" of sorts to help promote the Libertarian party to people who aren't familiar with it. Once this toolkit is rolled out, then it will be up to you, the current members, to push forward and get the toolkit into the hands of those who have never considered the Libertarian Party before. Developing these tools is only the first step. The second step will be much harder. We must begin to organize events across the nation to introduce people to the Libertarian Party. This will take a lot of boots on the ground, but with a standardized tool set, will be possible. Let's make 2016 our year to shine. 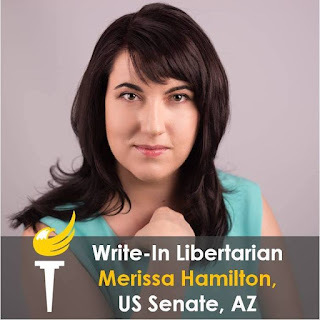 US Senate candidate for Arizona, Write-in Libertarian Merissa Hamilton speaks on constitutional duties of elected officials, border issues and more. The interviewee Merissa Hamilton, is running for US Senate in Arizona as a Libertarian Write-in. Interviewer is Alex Jones, an Independent contribution Contributor for the Liberty Chronicle Independent. “The American people overwhelmingly support a reclassification of this substance that is actually proven effective in combating multiple medical disorders as well as being safer than alcohol, tobacco, and most prescription painkillers. “DEA Administrator Chuck Rosenberg is blaming science when he is the one hamstringing the scientific process with a nonsensical classification. “Look, when even the American Academy of Pediatrics is asking the DEA to reconsider this classification and they STILL continue to stonewall, this is clearly not government of the people, by the people and for the people. This is just another example of unelected bureaucrats acting well outside the will of the American people and the two old political parties allowing it to happen. The Libertarian Party holds that individuals own their bodies and have rights over them that other individuals, groups, and governments may not violate. Individuals have the freedom and responsibility to decide what they knowingly and voluntarily consume, and what risks they accept to their own health, finances, safety, or life. The Libertarian Party has firmly stood against the war on drugs for 45 years and supports any measure, big or small, to dial it back until freedom is restored. Content not authorized by any candidate or candidate committee.